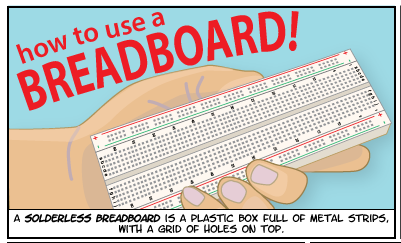 I’ve been working on a comic that explains how to use a breadboard and create a number of different projects with Maker Media for a while. Here are the first 2 pages– they explain the basics of setting up a board. Gareth Branwyn initiated the project as a workshop at World Maker Faire in 2012, Sean Ragan edited and wrote the text for the circuit examples. Fab thanks! I will be using this with my class in a few weeks!